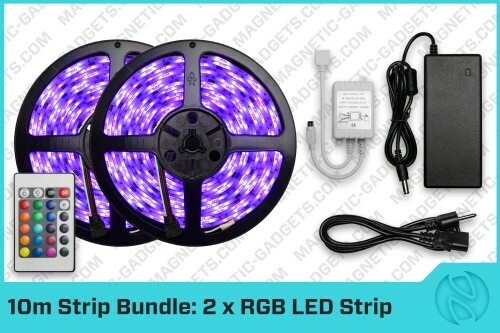 This 10 meter RGB LED strip bundle is perfect for elaborate LED lighting projects. You get 2 - 5 meter long LED strips, a supercharged 12V 6A power supply and a 24 key remote. The included 12V 6A power supply is strong enough to illuminate 10 meters of LED strip! LED strips offer creative options for upgrading the lighting of any room. Our LED strips can be used to set the mood in bedrooms, living rooms, conference rooms and office reception area. It’s also the coolest way to decorate any vehicle, bar and display counter. Our LED strips are self adhesive and connect with simple plug and play connectors. They are great for creating the perfect lighting for everyday living to party lighting. In this video we show you how to connect a single LED strip.